So as Christian citizens where do we begin? At one time in this nation patriots took a stand to defend their freedom. They fought for what they believed and helped shape the government of this great nation. Yet in the years since Christians have tended to swing back and forth between engagement and passivity when it comes to government participation. One moment they are founding a nation and infusing the Declaration of Independence and Constitution with Bible references and principles. The next they are retreating into church activities and leaving the public square to the secular and power-hungry. In the 1980’s Jerry Falwell rolled up his sleeves, climbed into the political ring, and led the nation to a “come-to-Jesus” moment. He raised up an army of Christian legislators, congressmen, school board members, and county supervisors. Prayer meeting sprung up on Capitol Hill. Liberal policies rolled ever-so-slowly back. Supreme Court decisions came to more closely reflect God’s views as by Christian reckoning. Then somehow complacency set in. President Reagan brought ‘morning’ to America, but instead of seizing the day, Christian conservatives went into hibernation. Evangelist Alex McFarland said,”Christians quit when they lose, and they quit when they win.” [Joel D. Vaughn. The Rise and the Fall of the Christian Coalition: The Inside Story, Resource Publications, 2009, pg. 202]. Maybe the ‘revolution’ lost steam under Bush 41 or maybe the dispiriting election of Bill Clinton sent Christians into retreat. Maybe Christians just thought they had done enough for a while and returned to their ‘plows’ rather than the polls. So it goes. One year Christians vote in droves and the next year they disappear from the political map. As Falwell put it,”Christians oftentimes think too small, aim too low, and quit too soon.” [Relayed by Alex McFarland in communication with Todd Starnes, December 2016]. Many Christians are now just confused. Is it right to participate in politics? Should Christians seek higher office? Do we consent to live under whatever kind of government our fellow citizens foist on us? Has the church and its leadership allowed such attitudes to develop? Is the church to shy away from politics? The liberal left would like Christians to believe they shouldn’t get involved with politics. They want Christians to gulp the ‘coolade of separation of church and state’ and just sit down and shut up. But as Christians we have a mandate to engage in politics and the culture. Our marching orders don’t come from the White House, the courthouse, the political party board room, or a gathering of bishops. They come from a much higher authority…the Word of God. The Bible says not to drop out, not to give up hope, and not to feel disenfranchised. So many American Christians have bought the secular lie that church and state must be separate… meaning have no influence on each other. Rightly understood by the original intent, separation of church and state keeps the state from meddling in church business, but was never intended to keep the church from speaking out and influencing the government. The meaning of this phrase , coined by Thomas Jefferson in a letter written after his presidency, has been twisted to mean the opposite of the original intent. By the way, Thomas Jefferson had nothing to do with the writing of the First Amendment. Our Founding Fathers clearly intended our government to be influenced by Christians. That’s why they wrote in the Declaration of Independence,”We hold these truths to be self-evident, that all men are created equal, that they are endowed by their Creator with certain unalienable Rights.” The rights did not come from the government but from God. 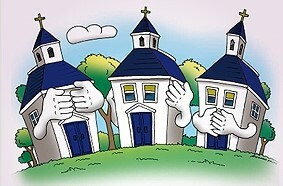 Why would they say that our rights derive from God and then ask churches to have no influence at all on the government? And as I wrote several weeks…maybe months…ago, when our Founding Fathers addressed ‘religion’ they were talking about Christianity since no other religion was taken into consideration . When the Founders wrote in the Bill of Rights,”Congress shall make no law respecting an establishment of religion”, it was to keep America from having a state-mandated, state-supported church as they had in England. Yet liberals, atheists, God-haters, and left-wingers bent on their own secular religious agenda, have used a ‘twisted’ interpretation to keep Christians out of the public square. Many Christians have ‘sipped this coolade’. So what must we do as Christian citizens? We all know that heaven is our ultimate home, but in the meantime we’ve got to ‘mow the grass and weed wack the front porch’ on this planet. Leaving the government to God-dishonoring people would be a travesty of our calling as humans. Next week we will look at five suggested duties of a Christian toward the government. It’s all in our effort to find the Church in the big scheme of events.